Aphelion alarm clock that stimulates you to play! Often we use to silent the alarm to extend the sleep, snooze. But a new innovative device not just alarms you but demands to awake and play innocently. Interesting no? 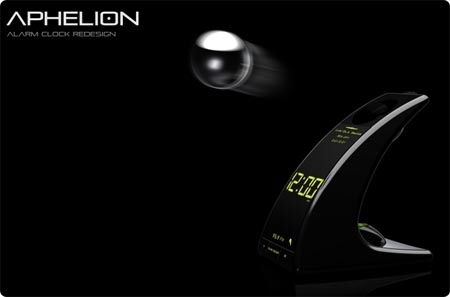 Aphelion is a unique concept alarm that has a playful and funny snooze function for the alarms function here is a ball, when the alarm goes off a ball flies off its cradle to across the room, sustaining the snooze function. So it makes you to get up and get back the ball to cradle, its not mean the switching off the alarm but activating the snooze, the ball will throw off after 10 minutes if you hit the sack again. You have to turn off the alarm manually.